The biggest city in all of Missouri, Kansas City is located just near the Kansas-Missouri border and is well-known for its rich variety of architecture, jazz music, food, history, and more. The city played a big part in key historic events like the US Civil War and is a popular tourist spot in the modern era, boasting a wide range of enjoyable attractions and activities. Nowadays, more and more people are heading to Kansas City to enjoy the city's unique zip line tours and experiences. 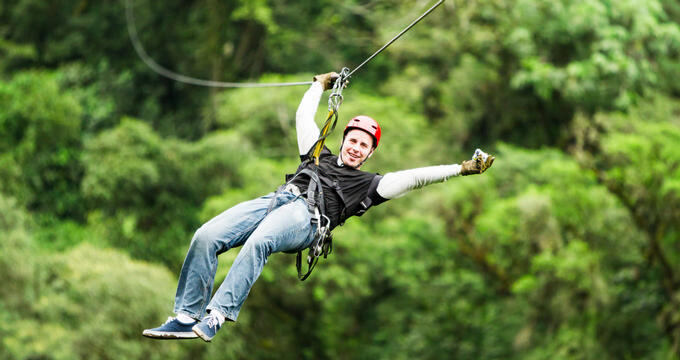 Zip lining started out decades ago but is becoming increasingly popular in modern times, with dozens of new zip line courses and tours starting up each year all around the world. Kansas City has a few great ziplining options to choose from, so if you're visiting this area and want to enjoy the surrounding forests and scenic sights like never before, it's vital to check them out. Boasting over a mile of zip lining action, Kip KC is one of the longest and best zip line courses in all of Missouri. This super zip line park offers a mixture of zip line tours to suit everyone. The most popular zip line experience with Zip KC is the Tower Tour. Lasting around two hours on average, this great value tour provides views of both downtown Kansas City and the surrounding natural areas, featuring five zip lines in total and speeds of around 50 miles per hour on each line. The final line is a real hit with thrillseekers, featuring a 12 foot free fall before the zip line snaps into action. Zip KC also runs more advanced tours like the Ultimate Adventure Tour, as well as the Ninja Training Obstacle Tour for adventurers who really want to challenge themselves, or the Hike & Zip tour for folks who love to walk among the woods. Zip KC also runs unique tour at night and during the sunset hours, providing a unique twist to the classic zip line experience and allowing riders to enjoy the scenery in a brand new way. All of these tours are wonderful to enjoy and give you plenty of reasons to come back time and time again. Children are allowed to take part in these zip line tours, but the minimum weight limit is 70 pounds. The maximum weight limit is 275 pounds, and all guests will need to sign a waiver before taking part. Just like with the Go Ape zip line tours, KC Zip participants should wear close-toed shoes and comfortable clothes. Zip line enthusiasts will know all about Go Ape. This is one of the very best brands in the business, offering all sorts of diverse and thrilling zip line adventures around the United States. Well, Go Ape has a location in Kansas City too, and it's one of their very best. As with other Go Ape locations, this is an exciting zip line course, involving the lines themselves, as well as various other obstacles, Tarzan swings, rope bridges, and more. The longest zip line on this route is a whopping 475 feet, and the total length of all zip line cables on the course is just over 2,500 feet. Guests will be around 50 feet from the ground while gliding along and non-riders can also enjoy the journey by walking along the various trails along the way. Each course takes between two and three hours to complete and is available to people of many ages and ability levels, offering super views of the various forests and surrounding areas just a little way outside Kansas City. Go Ape has made its mark on the zip line industry by offering well-constructed courses that everyone can enjoy, and the brand's Kansas City location is a prime example. This zip line course is open to all participants aged 10 and above. The minimum height limit is 4 foot 7 (55 inches) and the maximum weight limit is 285 pounds. Any visitors under 16 will need to be accompanied by an adult, and all riders will be given a simple tutorial by one of the friendly Go Ape staff members before setting out. As with any zip line adventure, it's important to dress appropriately, especially in terms of footwear. Favor close-toed shoes over sandals or slip-on shoes, and avoid skirts, short shorts, or loose items like hats and sunglasses.